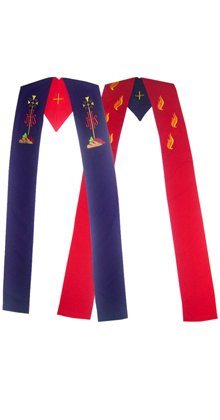 These elegant Stoles with hood, hand-made by artisans, have fine embroidery and a delicate design. This beautiful liturgical ornament has two sides. The red side has a delicate embroider of fire flames in golden coloured yarn. The purple side has the image of the bread and wine and the letters JHS embroidered.